Each year Fluid sets itself to have athletes representing their countries at the various World Championships, this year was no different with three of our athletes racing 70.3 Worlds in Austria, two racing Ironman Worlds in Hawaii and six racing Duathlon Worlds in Adelaide. The race in Adelaide was the final event on the calendar, a week after Hawaii. For the record, our Hawaii campaign was solid with Steve Guy coming home in 9:28hrs in a workmanlike performance, the 4th year in a row at Hawaii one of our squad has posted a sub 9:30hrs finishing time. We also had Stephen Natoli finish in 10:05hrs, a herculean effort from Nugget after crashing a few weeks before and sustaining a double fracture to his face. KUDOS. Now to Adelaide, we had three athletes in the Sprint and three in the Standard event at Duathlon Worlds. This team was representing 5 different countries, quite a diverse group from Sweden, Japan, New Zealand, Team GB and 2 Aussies. You know sometimes specific groups just gel with their training prep, and this was the case with the Duathlon crew. They trained consistently and relentlessly throughout the Winter, suffering through the coldest Melbourne Winter in 26yrs. There were no major disruptions with injury (except Kenny) and of course at times things got tough balancing time with work, training, motivation but each of them stuck at it and generally remained on top of their training and adapted well to the training I set. Our lead up races went very well, Vanessa Jackson, Lesley West and Lyndsey Foster were consistently winning overall, the age group or top three at each of the local Tri Vic Duathlons. Lyndsey picked up 2 State Duathlon titles in the preparation, one in Queensland and the other in South Australia. 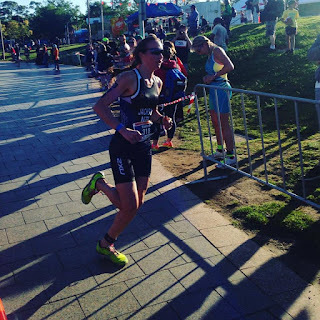 Lesley also won the SA state title race for her age group. Things were humming along and you could see the Sprint training was working well. There was lots of race pace solo bike and run training and also hard bike to run brick sessions in our schedule. It was all about training fast and often, with minimal extended longer sustained sessions that would require too much recovery time post. Finally race week came along, and you could tell in the final stages of the prep that the squad were well and truly ready for their tapers. It's pretty standard once an athlete hits the final full week pre taper they can see the finish line and just want it over and done with. This was the case with a few of our squad, so I knew they were ready and ripe to taper down. Lyndsey (my wife) and I had flown in to Adelaide after watching the Hawaii Ironman squad compete, if it was a warm day it would suit the weather we had been training in in Kona. The day before the race had arrived, and as usual for me its was all about letting the athletes get their check-ins and associated race responsibilities done, and making sure they stay off the feet and out of the sun as much as possible, with minimal stress. We got the obligatory group photo, made sure that each of them knew the layout of the area, and then it was wrap them up in cotton wool time and make sure they can get a good rest the night before. It had been a warm Saturday, and Sunday morning looked to be shaping up the same. Lyndsey and I did the 5min walk to the race venue, lots of Americans around, they had brought over a large team, and being patriotic they were all emblazoned in their stars and strips. The carefully organised warm up times I had set the day before with the squad went out the window, as each of the crew had things still to do, so I turned into bag minder whilst they did their drill and strides on their own time pre race. The two races were 30mins apart, the Sprint was first then the longer Standard Duathlon. 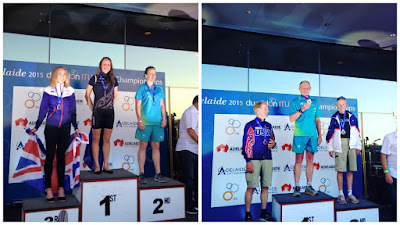 We had Vanessa Jackson (NZ), Marzia Cescon (Sweden) and Ken Murley (Aus) in the Sprint. Vanessa had a ripper start and took off alone at the front of the first run and was flying, Marzia was in the same age group and was sitting top ten. Kenny looked good as he started, straight into the lead on the first run, and being a 5x World Champ I knew if he got to the front, it would be hard to peg him back, even though he was carrying injuries in both feet and had some major seizures in the lead up that curtailed his preparation. They were onto the bike when the standard race started. Lesley West (Great Britian), Lyndsey Foster (Aus) and Ryo Tsukui (Japan) were our athletes in the Standard race. Our athletes would need to have everything go right to finish high up in the standings. The first run was taken out fast and our girls were sitting top five, with Ryo a touch further back. Watching both races simultaneously was a bit of a challenge and we had supporters acting as spotters to keep track of their progress. Our Sprint squad seemed to be going very well coming onto the last run, with Vanessa and Ken both in the lead. Marzia was top ten and pushing hard. In the final kilometre of the sprint race, we had positioned ourselves near the finish chute. Vanessa was the first to come into view, she was flying and as usual looked great with her style. We weren't sure with all of them how they were placed, but as Vanessa turned into the chute, the announcer said here is our winner, as we started to going nuts. I was standing with Nessie's parents and they were so proud, as they had come from New Zealand to watch her compete. Marzia had a great race also, finishing 7th in the same age group. 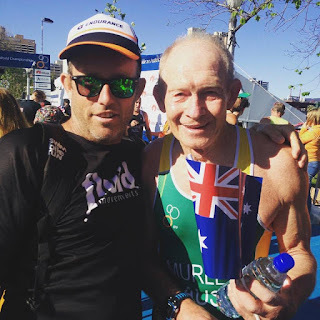 I was so bloody proud, he was as hard as nails, no one would believe he was 70-74age group. 2 World Champions, WOW, we were all buzzing. Now to the completion of the standard, we had time to get back to the bike course with our crew of family and spectators, and they were all riding strong and looking focused on the 40km loop of the bike. Lap after lap went by and finally they were on their final loop and coming in for the run. We weren't aware, but Lesley had just been passed and was in 4th. As that happened, she dropped her chain, allowing the American girl to put some good time into Lesley coming onto the final run as Lesley had to stop and fix her chain. We saw them all go out onto the final 5km run from the other side of the river, then they looped around past us with about 2.5km to go. Kim, one of our spectators informed me of the mechanical, and as the 3rd placed girl went past we started the clock to see the deficit to Lesley. The encouraging thing was that the American was dying and looked to be running slower than Lesley. As Lesley passed I screamed to her 54seconds to podium. She grit her teeth and went after her with everything she had. We also saw Lyndsey and Ryo run past, both hanging tough in the final stages, then we ran back over the river to the finish line. Lesley had buried herself in the final stage of the run to make up time but agonisingly fell 14sec short of the catch. Lesley finished 4th at Worlds, a remarkable effort at any rate. Lyndsey was coming into the final few hundred metres and had given it everything, this was plain to see. Coming around and into the chute I was so proud of my wife who had left it all out there in her first World Championships. The day didn't go totally as planned, but Lyndsey did her absolute best with what she had on the day. Ryo came through, finishing 25th in a strong field, a great effort from a runner who had just really picked up cycling for the event. I was so proud, we had two new World Champions, a 4th, 5th, 7th and 25th at World level. What a day for our sprint program, as a coach I was so proud of how our squad had done and I will remember this for a long time. Finally I would just like to thank all of our athletes and the families that came over to cheer on our squad. Your support made a real difference.